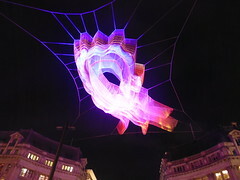 Yesterday evening, I went along to the early part of the evening at the Lumiere Show in London. 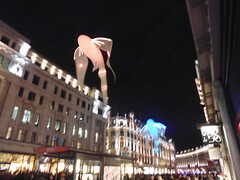 I stayed around the Regents Street and Trafalgar Square side. It was a touch crowded crowded as I made my way down from Oxford Street to Trafalgar Square. 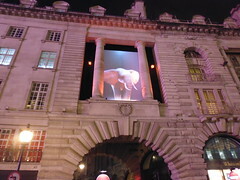 I did spend a little time at the junction with Air Street where the elephant was wondering through the arch with sounds. I’m not sure that it worked on that context as the audio seemed a little lost within the open space. The main net was powered by phones logging into the WiFi and visiting a certain site. The installation changed along the visible spectrum. Floating Whale type devices floated above the crowds (like a Gibson inspired Festo installation from Pattern Recognition). I do wonder if the Internet powered installations might have benefited from some sound with it but this might be hard to define. Beat boxers and buskers were out in force and the evening felt like a party (but very crowded).